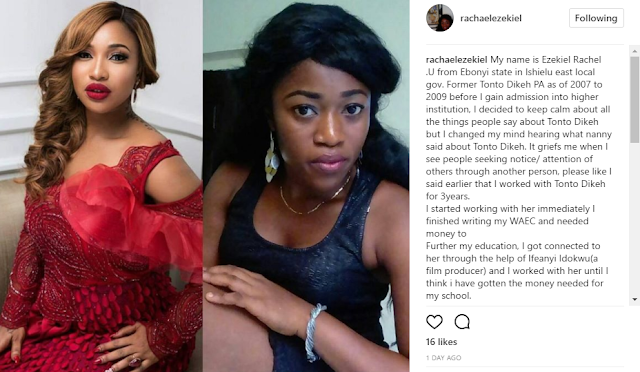 However in her post on her IG page, Rachael debunked the nanny's claim, adding that all the while she worked with Tonto, the actress was very good to her. Read what Rachael wrote after the cut. My name is Ezekiel Rachel . 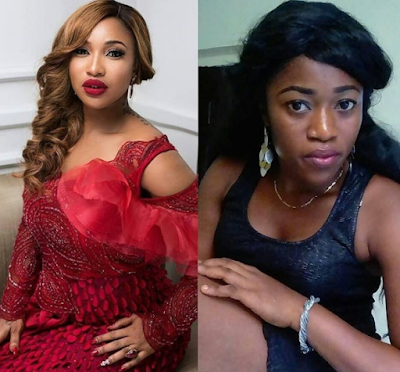 U, from Ebonyi state in ishielu east local govt, former PA to Tonto Dikeh as of 2007 to 2009, I decided to keep calm to all the sayings about Tonto Dikeh but I changed my mind hearing what a nanny said about Tonto Dikeh. From 2007 to 2009 that i worked with my Aunty, she has never assaulted me verbally just like her nanny claims, she cares for me like her younger sister, provide whatever I need, shower I and my family with gifts, always ready to listen to me, allows me to express myself anywhere we go, takes me to everywhere she goes, if she enter flight, I enter with her. I can say much about a person, I was with for 3years, at least you can agree with me on that. Am writing this to inform the world about the type of person my aunty is, she is a lady with good heart, caring type, she love covering her loved one's fault, easy going type, a giver with a large heart. I love her so much cause I saw a lot of people she carried along while working with her. Words are not enough to describe Tonto Dikeh but all am saying is that, do not be in a hurry to conclude what people say about another cause we have a lot of whoremongers, joy killers and idiots in this life. To my aunty @Tonto please be mute to all their sayings cause am ready to reply any idiot that will try to cramp your image again".